A major construction program underway since mid-2013 to upgrade Sohae’s gantry and launch pad—site of Pyongyang’s last two Unha-3 space-launch vehicle (SLV) tests—to handle larger rockets with greater ranges and payloads. 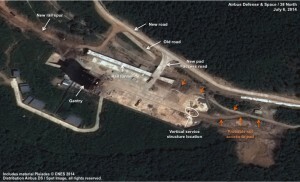 As of July 2014, North Korea had increased the gantry height to over 50 meters, completed construction of a new wider road onto the pad to carry larger rockets, and was building a rail spur from the existing siding that would also carry larger rockets directly to the launch pad. These modifications could be completed by 2015. The fourth series of tests of the KN-08 road-mobile intercontinental ballistic missile’s (ICBM) first stage rocket motor in 2014. Imagery of the rocket test stand beginning in late May 2014 through July 6shows evidence of a new test series, including the presence of first stage rocket motors, distressed vegetation along the edges of the flame path past the flame trench and different stain patterns and colors inside the flame trench. The rocket engine test program may wind down by the end of this year although a key consideration will be how successful the tests have been. If the engine tests are concluded, the next stage in development of the KN-08 road-mobile ICBM may be full-scale flight tests of the missile. Imagery beginning in March 2014 also identified building activity in the hills in the northwest area of the test center. 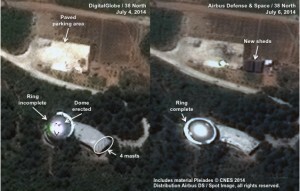 While initial photographs pointed to the construction of a possible mobile missile training area, subsequent imagery shows two domed structures, the purpose of which remains unclear. The internal layout of the larger structure indicates that it may be an auditorium intended for use as a training center, area for displaying SLV/missile hardware or as a launch control center that might accommodate VIPs, clients or the media. Figure 1. Overview of activities at Sohae. Commercial satellite imagery from July 4, 2014 shows the nearly completed modifications of the gantry and launch pad area. The three new upper levels of the gantry are complete with swivel platforms. In addition, light colored covers have been installed over the front of the four lower swivel platforms that appear to be for environmental protection. A new building whose function is unknown has been constructed at the southern end of the pad (figure 2). When completed, the new gantry will be able to support a rocket up to 50 to 55 meters in height, 20 to 25 meters taller that the 30 meter Unha-3, launched in 2012. The diameter of the first stage can not determined from available imagery, but the Unha plug with a 2.4 meter diameter was set inside an opening in the mobile launch stand about 4 meters in diameter. The new rocket’s first stage may have a similar diameter. The removal of the 24 meter-long boom on the crane at the top of the gantry, which would be used to erect the rocket, may be a significant development. Figure 3 shows how the gantry crane erected the Unha first stage in preparation for the December 2012 launch. The stage was lifted into a vertical position and set on the mobile launch platform. While the North Koreans may be planning to put a stronger boom on the crane to handle a much heavier rocket, if it is not replaced, they may be planning to construct a vertical assembly building on the east end of the pad. The 200 meter-long launch pad was initially built with the footings for such a structure 160 meters from the gantry. Rails from the mobile launch stand extend to these footings. There is recent construction activity at this end of the pad, the purpose of which is unclear. Figure 2. 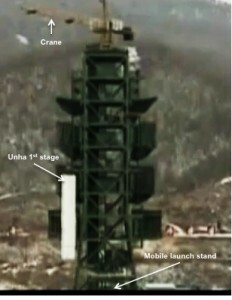 Three views of the modified gantry tower on the Sohae launch pad. Figure 3. Stacking of the Unha-3 first stage for the December 2012 launch. Image: KCTV screengrab, December 2012. Construction has progressed on a new wider access road and rail spur leading to the launch pad that will enable the movement of much larger rockets to the pad in the future. Work on the wider access road and bridge over a stream were completed in early July 2014 (figure 4). Figure 4. 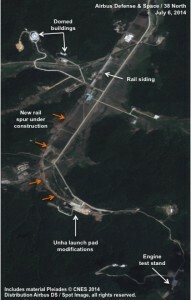 Overview of activity at the Sohae launch pad. Significant progress has been made in the construction of a 1.42 kilometer rail spur, begun in March 2014, from the rail siding to the launch pad, with track laid about half the distance. The rail spur enters the pad area from the west, immediately enters a newly built 120 meter-long, 4 meter-wide tunnel and then comes out two thirds of the way up the pad (figure 5). The track may eventually run into the area of new construction at the end of the pad, reinforcing the possibility that the North may intend to construct a new vertical assembly building for larger rockets. The rocket would be placed on the movable launch platform that would then move on rails into the structure. The erected rocket would then be transported on the platform to the gantry tower. Figure 5. 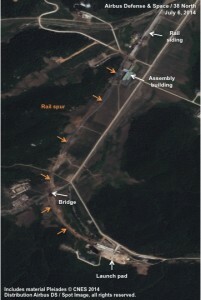 New rail spur to the Sohae launch pad. 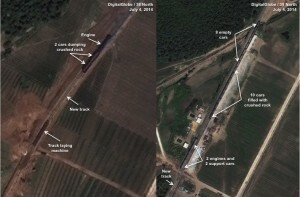 Imagery from July 4 shows two rail cars dumping crushed rock onto new tracks south of the missile assembly building and a track laying machine just ahead of them. Ten cars filled with crushed rock, eight empty cars, two probable engines and two support cars are visible at the siding, the most cars and engines ever seen at Sohae (figure 6). Two days later, the eight empty cars and one engine are gone. Ten empty cars and a track-laying machine, located at the siding, appear to be waiting for additional loads of crushed rock before the spur to the launch pad can be completed. Figure 6. Construction of rail spur underway. 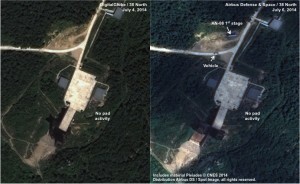 Imagery from early July indicates that North Korea may have begun a new series of rocket engine tests for the first stage of KN-08 road-mobile intercontinental ballistic missile (ICBM)—the fourth this year. This follows what appears to have been a series of tests, the last of which, occurred in early June. 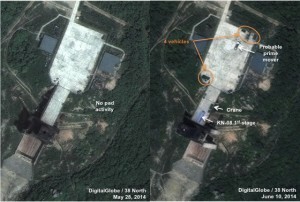 The KN-08 first stage has been identified at the test stand or the Assembly Building in imagery from June and July. Additional evidence that a test occurred between June 10 and July 4 is the appearance of distressed vegetation along the edges of the flame path past the flame trench. Also, there is a slightly different stain pattern and color inside the flame trench during this time frame (figures 7 and 8). Given the frequency of DPRK testing of the first stage engine, the program may wind down by the end of this year, although a key consideration will be how successful the tests have been. If the engine tests are concluded, the next stage in development of the KN-08 road-mobile ICBM may be full-scale tests of the missile. Figure 7. KN-08 engine tests in early June. Figure 8. Probable preparation for another KN-08 engine test. Over the past four months, the North Koreans have been constructing two buildings with domes for roofs—one 30 meters and the other 10 meters in diameter—whose purpose remains unclear. Clearing and leveling of the site began in March 2014. By early April, very unusual foundations were seen. By May 10, a three-story 50 meter diameter circular building with a 30 meter diameter center section had been built and a 18 meter building with a 10 meter dome was under construction. Imagery from May 28 showed work had progressed further on the interior levels of the larger building. The north end appears to be an entrance for vehicles and the south end another entrance, possibly for vans and busses, with a paved access road allowing drop off and pick up of visitors. There are several levels at the south end with possible rows of seats installed on the second level. At the north end of the building on the ground floor there is open space. The third level is shaped like a horseshoe and might be for more seats. 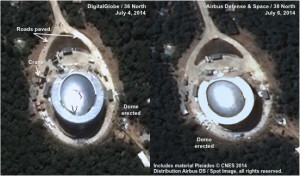 As for the dome, it appears to be made of some type of thick mylar-type fabric designed for outside use and is attached to the building at the fourth level as seen in the June 10 imagery. The fifth level is a circular roof and surrounds the dome and appears to have a shallow angle sloping down to the outside. In the July images, the area between the roof and the dome is being plugged probably to channel the rainwater to the outside. A gray square at the lowest level in the center of the building may be the base for a center pole used to erect the dome. The July 4 imagery reveals the dome has a small dark spot in its center where the pole may be attached. Buried cables or a generator probably provide electricity for the building. Work on the dome—and the exterior of the large building—were completed by early July. Imagery from late May shows 15-20 possible dome support ribs on the ground on the southwest side of the building that could be installed under the dome cover and then erected with a center pole. By June 10, installation of the 30 meter dome had begun. (It can be seen laying flat with dark objects on it, possibly construction supplies.) Also note the irregular edge of the north and east of the dome. The North Koreans appear to be fastening the dome material to the top of the building (figure 9). Figure 9. Work on unidentified structures continues at a fast pace. When next seen three weeks later, the dome is erected, the roads paved and landscaping of the site is in progress. There was still construction activity throughout the site, with much of it probably being done inside the building (figure 10). Overall, dome construction appears to have been fairly straightforward. It was built in only 40 days with limited equipment, including just one crane. Figure 10. Erection of dome complete. Located 300 meters down the hill to the southeast of the large domed building is a smaller but related building with a 10 meter dome that was also built in the same time period. This single story structure is 18 meters in diameter with an attached curved single story building. Construction had begun on this buildings dome—erected on roof—by June 10 and appeared finished on July 4. Work on the surrounding ring was finished two days later as were two sheds adjacent to the parking lot (figure 11 and 12). Figure 11. 10 meter domed building under construction. Figure 12. Completed 10 meter dome installed on the building. While it remains difficult to pinpoint the uses for these buildings, information available to date indicates a number of possibilities. 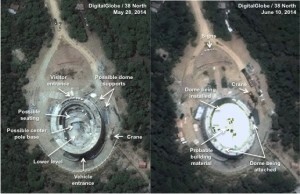 The larger 50 meter dome building appears to be an auditorium that could serve the following functions: 1) a military training facility; 2) a facility for meetings of high-level party and government officials related to North Korea’s rocket program; 3) a new modern launch and/or satellite command and control center; 4) a facility to brief VIPs and the media on upcoming satellite and/or missile launches and to view the launches on TV screens; or 5) a facility to display SLV and missile hardware to clients. It is worth noting that the circular ring on the roof of the buildings may represent the orbit of a low orbit satellite similar to one seen at the Three Revolutions Museum in Pyongyang. The smaller 10 meter domed building probably supports the function of the larger facility possibly including: 1) a check-in and orientation center; 2) a media center; or 3) a radar tracking antenna. The test program appears to have started in August 2013.